I’m not a political scholar who has been studying the matter for decades at Harvard. (Though, I do like to occasionally play one on TV the internet.) I’m definitely not proclaiming this to be a definitive story on the deep origins of the Republican Party’s current implosion (or explosion, depending on how you interpret the show). In fact, I’m guessing there are numerous origins, and each one could probably warrant a book or series of books. But I think there are some interesting factors at play that I wanted to highlight, because they do relate in indirect but critical ways to climate change and cleantech. First of all, I should probably make explicit what the implosion/explosion I’m referencing is. Obviously, it involves Donald Trump, but this is not something that one lone wolf has done. At the beginning of the GOP primaries, political experts (including engaged citizens) basically saw Donald Trump’s run for president as a joke. Honestly, I think Donald largely considered it a stunt, an attempt to get in front of the camera a little more, and a venue for venting/ranting about things that annoy him. I think he was genuinely shocked at how well he was doing early on in the primaries. “Can you believe this? I can’t believe this. Can you believe how well things are going?,” Trump said to Joe Scarborough when he was gaining serious momentum in December. For sure, much of the nation was shocked, and became even more shocked as time went on and he became the presumptive nominee of the Republican Party. debate terminology like “Little Marco,” “Lyin’ Ted,” etc. claims that an Indiana-born judge overseeing class action lawsuits against him is obviously biased since he is of Mexican descent (and Trump has the wall plans noted above). This craziness alone has led many to announce a civil war within the party, a potential destruction of the party, and near anarchy for the Grand Old Party. Though, the GOP is still holding together by a few threads. But several prominent people in the GOP are not turning a blind eye to what they see as reckless, immoral, and extremely dangerous comments from Trump. As one of the latest examples, Richard Armitage, who was deputy secretary of state under George W. Bush and assistant secretary of defense under Ronald Reagan, has said that he will vote for Clinton rather than Trump. He will be joined by several other political elites and common Janes in the Grand Old Party. So, that’s the premise, in a nutshell. But how did we get here? But the Trump side of the equation isn’t really the important side. He’s just the icing on the cake after decades of work making the batter and baking the cake. The communist witch-hunts that occurred with the infamous McCarthy were quite powerful fear-mongering that brought political power to some of the key people who led them. It’s unclear how that played into development of political strategy years later, but it is well know that around the time of Richard Nixon’s rise to leadership, the Republican Party expanded that aggressive approach and targeted broad and consistent fear-mongering about “others” to Southern white people. Unfortunately, the cynical and divisive approach worked. Ronald Reagan carried on the approach, and expanded its breadth and depth, and you’d have to be completely oblivious to not see it in use by the Republican Party and its media arms today. while not absolute, large factions of the Republican are very anti-immigrant and continuously propose disruptive deportation and community raids. The thing is, many Republicans aren’t actually anti-minority and pro-billionaire racists who don’t want to help the poorest people in our nation, don’t want the country to be more egalitarian, and don’t want to keep the USA the immigrant-friendly nation that made it into the global leader in many political and economic senses. However, tied to ideology regarding fiscal conservatism, Christian religion, or decentralization of government, there are many in the party, and in party leadership, who are willing to overlook the Republican policy agenda they don’t like, and are even willing to vote in line with the party agenda (against their own common sense) simply because that’s what’s expected of them (I’m restraining myself to keep from going on a tangent about tribalism, freedom of thought, and idiotic voting behavior in Congress). But everyone has their limits. Donald Trump’s explicit and genuinely dangerous xenophobia is making many of these Republicans realize that the Southern strategy is for real, and has even expanded significantly as “fear of others” (especially people with browner skin) has been promoted, and promoted, and promoted by Republican media and politicians for decades. So, you are left with 1) the people who actually think Donald Trump’s paranoid xenophobia is logical, 2) the people who don’t actually care about it, as long as it doesn’t harm their or their party’s chances at greater political power, and 3) the people who are appalled to discover what their political partners really think and want to do. Where will things go from here? Will those who are tired of the hate-mongering finally jump ship, and force Republican Party leadership to change course if the party is to remain competitive on the national level? Will those who support the hate-mongering destroy the party if it tries to move beyond extreme prejudice and fear? Will group #3 simply give in and guiltily support politicians like Donald Trump, Ted Cruz, and the racist, anti-poor, pro-rich policies they demand? I think people like early presidential candidate Lindsay Graham are wondering this nearly 24/7. Yes, this does all come around to cleantech, in a huge way. Political contributions from the coal industry. Note that dark and light red are for money sent to Republican and conservative groups, respectively. 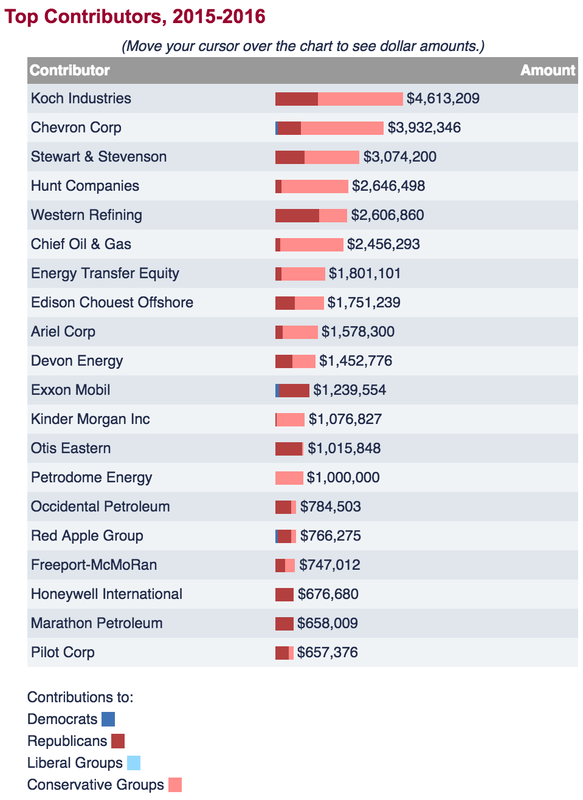 Political contributions from the oil & gas industry. Note that dark and light red are for money sent to Republican and conservative groups, respectively. One key reason the Republican Party has consistently opposed strong climate action and cleantech deployment is that fossil fuel industries (oil & gas and coal) heavily support Republicans by tossing them millions and millions of dollars every year. The strikingly unbalanced charts above should demonstrate that well enough. But I wouldn’t say that’s the only key reason. Global warming and climate change are, again, mostly harmful to “others.” Yes, there is also tremendous harm on the doorstep of everyone alive today, but not many people understand that, and pretty much everyone can get the idea that global warming and climate change threaten future generations much more than us. Additionally, those living in developing countries, countries with extreme climates, island countries, etc., are the ones most vulnerable. With compassion for “others” weakened to a corn kernel, if that, the call to action to help stop global warming falls (to some degree or another) on deaf ears. With the underlying desire for “society to remain as it is,” global warming is also an extremely scary affront on people concerned about change. While that can stimulate action, it can also give people knee-jerk denial. And the idea that we need to transform our energy, transportation, and agricultural systems in order to address the problem just hits the other knee. Cleantech isn’t just another tech transition that is exciting to early adopters, too abstract to the mainstream, and scary to tech-adoption laggards. Cleantech is massively changing economic and other societal structures as it moves humans, for the first time since we discovered fire, away from greater and greater burning of limited resources. 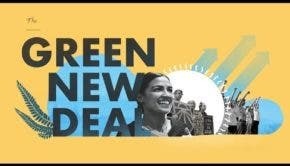 I think that, for these reasons, along with the inherent corruption of hundreds of millions of pollution dollars trying to weigh the scales in favor of Republicans, many Republican policymakers have been willing and even eager to go against the clean energy and clean transport preferences of their constituents and support pollution over cleantech. As with the other moral issues mentioned above, however, one wonders how long that can actually last. Image credits: Gage Skidmore via Foter.com / CC BY-SA; DonkeyHotey via DIYlovin / CC BY-SA; RedSpruce / no known copyright.